Intrepid master's student in Folklore embarks on her thesis research in southern Saskatchewan, with some trepidation. If you haven't guessed already, the subject of this research is barns. Once a landmark on Highway 13 just east of Cadillac, this barn finally fell some time in 2015. Yikes, it's been more than three years since my last post! The thesis? It got finished. The degree was awarded, and so all the hard work resulted in something. If you're so inclined, you can read the thesis in its entirety here. I've been busy making my way in the working world (happily, in the heritage sector), and while barns faded into the background, I never lost my passion for them. I may not be actively barn hunting any more, but you can bet that I still take the time to admire a good barn in my travels, and once in awhile people still contact me with tales of their barn. Or ask me how they can get money to save them. For that last, the answer is, there aren't many places! In Saskatchewan this past year, the only granting agency specifically for built heritage in the province, the Heritage Foundation, lost its funding from the provincial government. 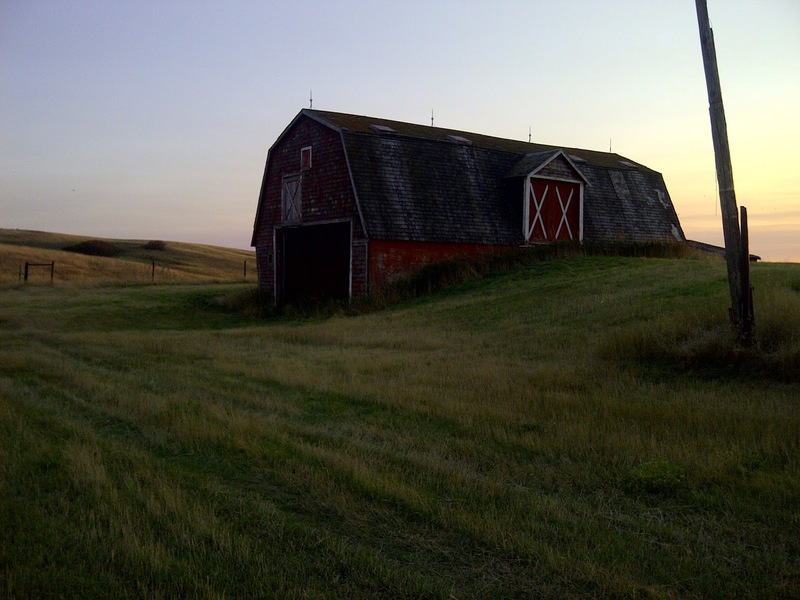 As that organization works to restructure itself, there are very few dollars available for restoration work on buildings of any kind, particularly not the humble barn. This year, after a couple of years of nothing really going on, barn-wise, I was called back to my role as barn hunter. 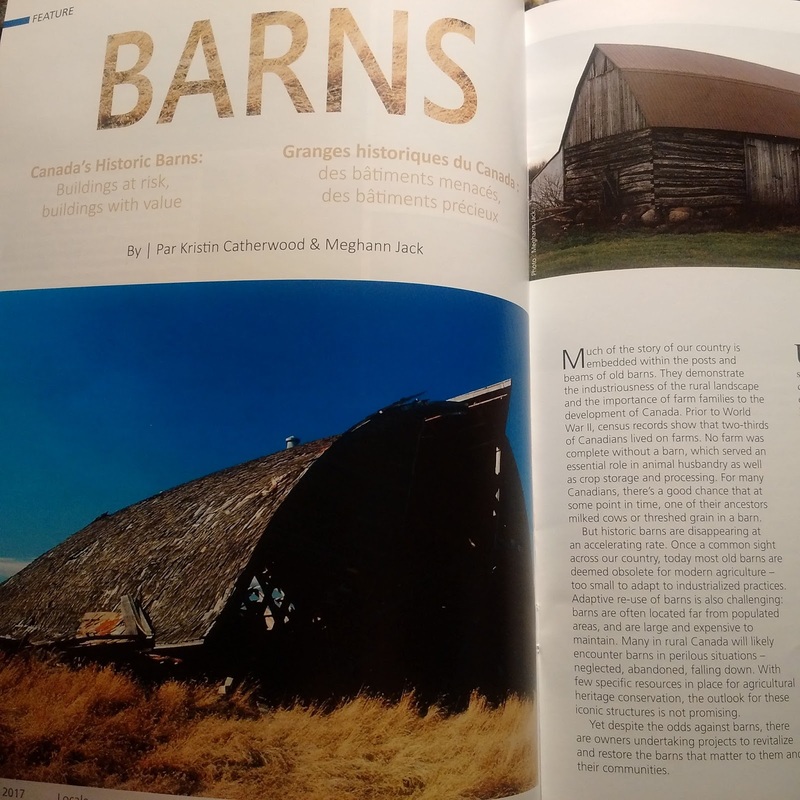 First, my good friend and fellow barn hunter Meghann Jack and I wrote an article for Locale - the magazine of the National Trust for Canada. Secondly, and in connection to the first, I was invited to speak about the plight of barns at the National Trust For Canada's annual joint conference in Ottawa. My talk, "What Are We Going to do About Barns? "part of a larger panel about conservation efforts around the world, was well attended, and I had some very fruitful discussions afterward. The National Trust recognizes that barns are endangered across the country, but what will come of that understanding remains to be seen. And what about the barns themselves? Well. Most of them are still standing, but we've lost a few. In fact, this was the main point I made in my presentation in Ottawa. Since my survey in 2013 in which I identified 123 existing barns in my study area, I know of at least six that have fallen down or been taken down. There very well may be more that have been lost, since I haven't gone back over the entire survey region. You can imagine that at this rate, it won't take long before there are hardly any barns left at all. However, with the bad news, there is also good. In the Locale article, I featured two barn success stories from my area. 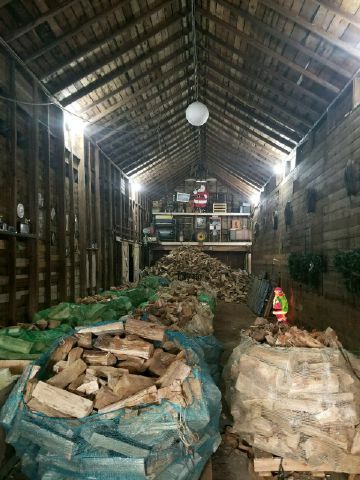 The first, the Carles barn, has undergone a multi-year conservation process. And the Levee barn just had its first season in its new iteration as a Christmas tree store. Barns will only survive if people make a concentrated effort to save them. 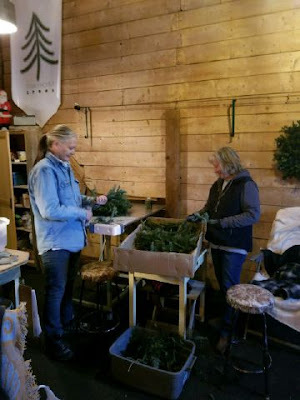 The Levee barn has become the headquarters and shop of Traykym Trees, a Christmas tree farm just north of Radville which just finished its first, very successful season. It's been wonderful to see this project take shape, and congratulations to Kim Levee and Tracy Bain on their dream coming true (after lots of hard work). Here Tracy and her sister Brenda work on handmade Christmas decorations that are sold out of the barn. 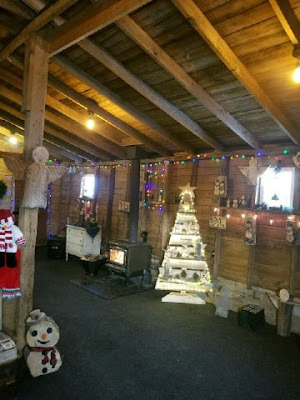 Roland and Darlene Carles, along with their son Carey and daughter-in-law Richelle and grandchildren have spent years (and a good chunk of change) working to preserve their barn for many decades to come. Case in point - "my" own barn - the barn which is part of a farm my dad purchased in the 1970s known as the Sidehill. Built in the late 1940s, the barn is one of the newest in the area built in the old gambrel-roofed style. It is also distinctive in that it is a bank barn - built into the side of a hill. My dad had it painted in 1980, but since then it has simply weathered the elements. It's in okay shape, but it needs work. And so, I figured I better put my money where my mouth is, and have decided to take on the responsibility and expense of ensuring that work gets done. Rather than tinning the roof, I want to shingle it with its original cedar shingles, paint it, and shore up a concrete wall. With this work done, hopefully the barn will stand for a long time yet. The Sidehill barn during the full bloom of summer last year. It needs a new coat of paint, new shingles, and some cement work. I'm determined to see it through! The barn in context as part of the Sidehill farm - aka the most beautiful place on earth. After the barn, maybe the house? And with that, I sign off once again. I'll keep this blog up as a record of the work I did, and will update it if I have further news to share. In the meantime, wishing you and yours a joyful holiday season! ...and no one is there to hear it, does it make a sound? This was once one of the largest barns in the district. Date of collapse unknown. North of Hardy. October 30, 2013. 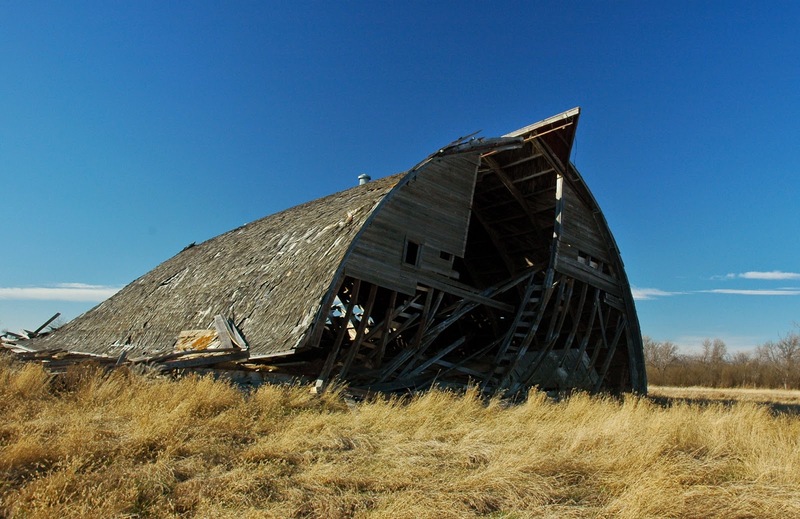 Saskatchewan is littered with the decaying corpses of barns. There are even more unmarked barn graves. One of the oldest barns in my immediate area was torn down just the year before I began my research. A casual passerby would never know it had been there. The barn was demolished, the debris pushed into a giant hole that had been dug for the purpose, and filled in. No gravestone. 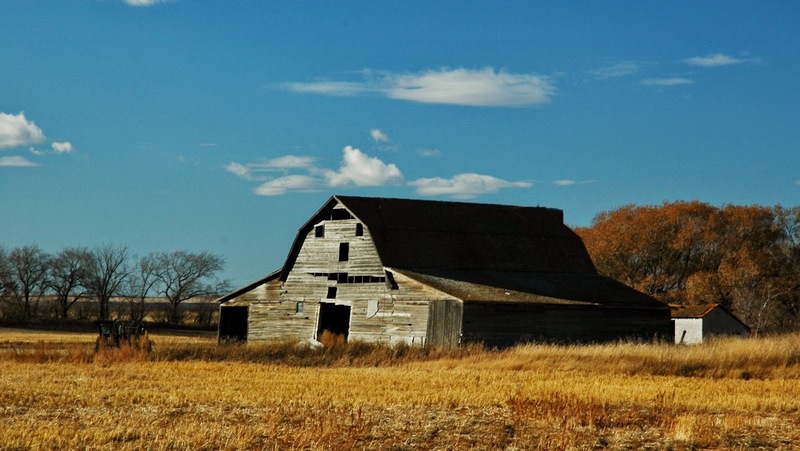 This summer, two big barns on Highway 6 south of Regina blew down in a severe thunderstorm. In both cases, the houses were miraculously spared. But the barns, one of them painted within the past five years or so, reflecting the owner`s care for it, were destroyed in seconds. It was something people talked about. Landmarks, gone. Another barn, a less impressive white gable roofed building, on the same stretch of highway fell sometime last year. It had developed a severe lean and every time I drove past it, I knew it wasn`t long for this world. Now the roof sits on top of the collapsed barn. It was like an old horse that just lay down one day and couldn`t get back up again. I wonder if anybody witnessed the exact moment it happened, and if so, if they felt a sense of loss. 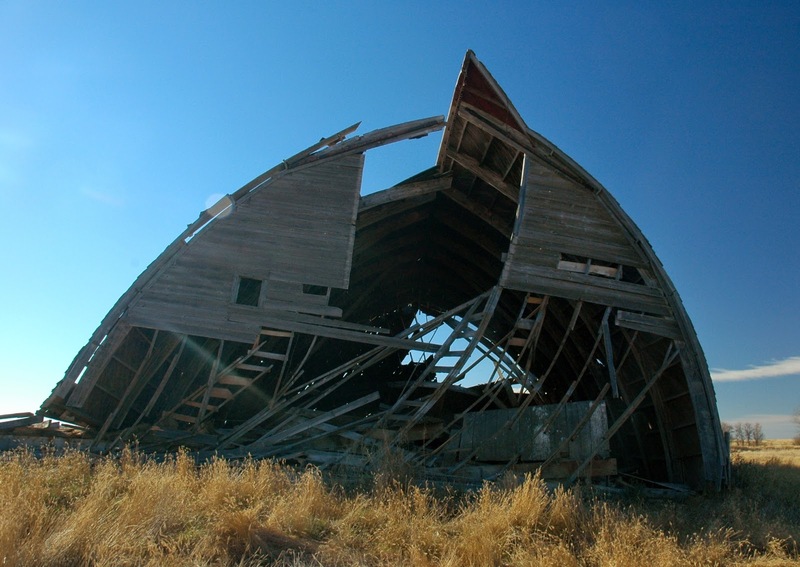 There`s something about seeing a collapsed barn that speaks to the impermanence and constant change of our existence. It also, at a more mundane level, speaks to the constant evolution of agriculture. But it`s more poignant than that. If it wasn`t, people wouldn`t be talking about the destruction of barns that had no personal connection to them in such a sad and nostalgic way, like they did a couple of months ago when I was sitting in the doctor`s office and that was the topic of choice for waiting room chatter. 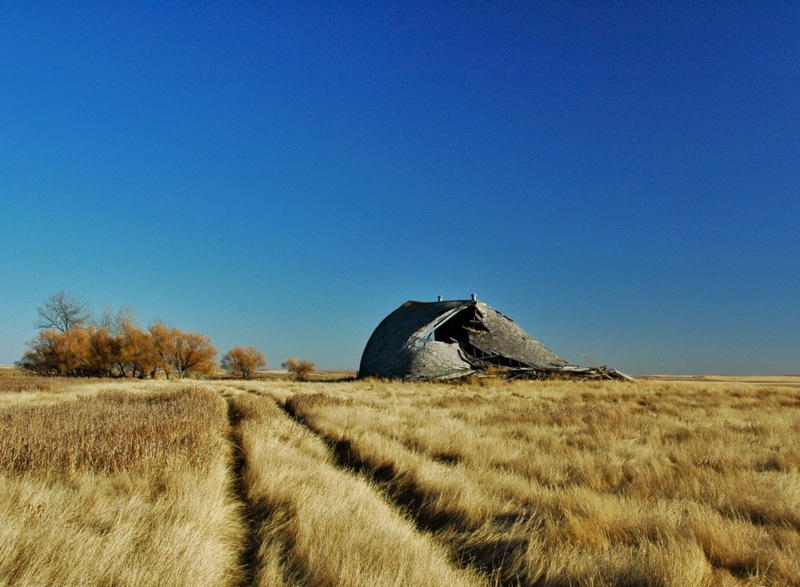 On my barn hunting expeditions last year, I saw countless barns that had lost their battle with the elements, had succumbed to the fierce prairie wind. Some hang on for years in a perpetual lean, facing off against Nature, the force working ceaselessly to take them down. Some slowly rot from the inside out, their nails rusting slowly away, leaving nothing to hold the barn together. Some, their roofs bare to the sky and the rain and snow that comes from it, collapse into themselves. Still others, like the two on Highway 6, looked strong and sturdy. They had been taken care of, looked after, nurtured in their old age. And one freak wind destroyed them. The Gothic roof style is still visible. October 30, 2013. The overgrown trail is a testament to the neglect of this long abandoned farmstead. October 30, 2013. Thesis status: still in progress. After all my lofty ambitions and well-laid plans, guess what? Summer happened. I got a really good job in a museum in Ogema, a lovely town about thirty miles from home. Though not a huge distance, it was far enough that I spent a lot of time simply going back and forth to work. Then there was work itself. And my giant garden. And the all-too-brief Saskatchewan summer. And so, the thesis got relegated to a back burner on very, very low heat. I readjusted my goal and went on with my life. I completely neglected this blog, partly out of a deep sense of shame that I wasn't living up to my self-imposed standards, and partly because, frankly, I just wasn't thinking about barns all that much. Other things grabbed my attention. But they were important things, and I don't regret it. For instance, I began a new blog, from the gap, which explores my love for my home region and delves into some prairie folklore and history. But now summer has ended. Autumn approaches quickly, and it's already been a full year since I began my barn hunting adventures. I have returned to my thesis and I'm slowly but surely getting back into a barny state of mind. My new goal is to finish the thesis by December, and I'm quite confident I can do that. I'm not going to track my progress on here, though, like I had so foolishly thought would be successful back in May. I'm learning to let myself just work the way I do best: sort of haphazardly by-the-skin-of-my-teethly. Disorganised and jumbly and fumbly and yet somehow, I manage to get things done, and usually on time, too. So, we're going to go with that. And, instead of imposing a strict blogging schedule on myself, like I did last year, I'm going to write new posts when I feel the inclination to do so. I started this blog because it was fun for me to share all the wonderful experiences I was having. It didn't feel fun anymore when I turned it into a weekly obligation. So, there will be new posts. Who knows when, and who knows what about. I'll surprise you, and myself. A barn I drive by every day. East of Ceylon. November 1, 2013. This is what a Great Horned Owl in a Saskatchewan barn looks like. I love owls. Owls love barns. I love barns. It was only a matter of time until the inevitable happened: an owl sighting in a barn. When I was growing up, there was an owl living in our barn up on a hilly piece of my dad's land. This barn owl was a legendary creature who lived for many more years than most owls do and was the father of an impressive line of owlets. When I say legendary, I mean that literally. 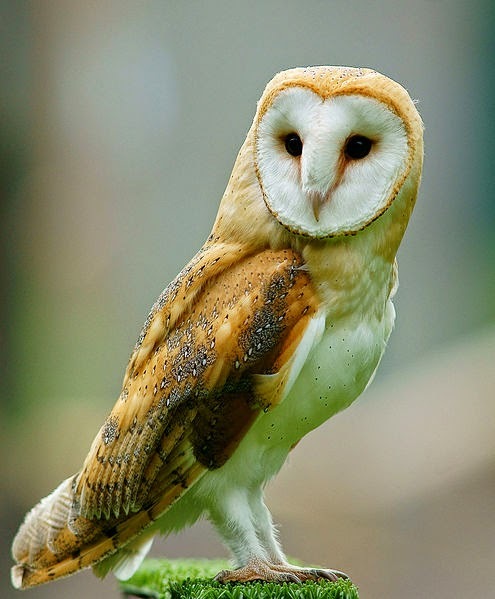 Most of the tales we heard of this barn owl were inventions of my dad, which I only realised relatively recently. There was indeed an owl who lived in that barn for a time, but my dad made up lots of stories about him to keep us kids entertained. I think my obsession with owls started at that tender age. I love them so much I even considered getting an owl tattooed on my shoulder in a crude simulation of the Greek goddess of wisdom Athene who was often depicted in art with an owl perched on her shoulder. I regularly receive birthday and Christmas gifts with owl motifs, such as jewellry, contact lens cases, phone cases and the like. My spirit animal would definitely be an owl. Nothing gives me more delight than to hear the 'whoo-whoo' of owls late at night outside my window. Owls are regularly associated with barns, so you would think I'd have seen one before now. Though I've seen a fair number of owls in my time, but never one actually IN a barn until just a few days ago. Last fall during the survey, my dad and I were documenting the barn pictured above. As we got close to measure it, an owl came swooping out, a startling and exciting event. The barn, by the way, is located just a few miles west of my farm in the Gap and is an example of a "cut-down" barn. Cut-down barns are the roof and loft of a barn which has been cut down to create a smaller building. The original ground level is removed. Usually this was done to save a barn that was in poor shape, or to create a building more suitable for storing machinery when the barn was no longer in use. There are several examples of these in my study region. The other evening, my brother and I were speeding down the Correction Line with my camera in tow en route to a photo opportunity some miles to the north involving a family of foxes. We had been alerted to this by my sister who had just seen them on her way to Regina. As we approached and passed the cut-down barn (in the blink of an eye, of course, since we were in the Le Sabre), I mentioned casually "there's an owl in that barn" and glanced back at it, only to see, you guessed it, an owl. With great excitement and some difficulty (owing to the Le Sabre's inherent speed demon nature), I slowed down, and with great care, reversed at a snail's pace until we were level with the barn. Because of the fox photo hunt, I just so happened to have the telephoto lens all ready to go on my camera. The light wasn't ideal, and the distance was still too great to capture him in detail, but the owl patiently posed for the barest of moments while I got my shots before turning and alighting silently from the window. If there was ever a Kodak moment, this was it. I think I have to thank Athene for that one. I drive past that barn several times a week, usually so aborbed in other thoughts that I don't even notice it. But for some reason that evening, I remembered the owl sighting from last fall and happened to glance back. As we have learned, barns in this area aren't used for much anymore. But they do make perfect homes for a whole host of wild creatures, as explored in the post The Dangers of Barn Hunting. Barns are a great habitat for owls since they provide shelter from the elements and a quiet, dark place for them to sleep during the day. Perhaps this owl had just woken up and was surveying the scene before taking off for his nighttime hunting. Or maybe he just knew I was coming and wanted to make sure I had something to write in my blog this week. Owls are always thinking ahead. The owl prepares to launch. What's that? A question about my thesis progress? Thanks for the reminder. Did I hit my goal of 33 pages? No. Are we going to talk any more about it? No, we are not. I continue to chip away at it every day and make progress, though not as much progress as I had ambitiously hoped for in my previous post. There are many reasons, chief amongst them procrastination, but we all knew that was going to happen. Perhaps next week I will have more promising news to report. Until then! ...to Windows Vista, the Barn Hunter's daily work venue has changed. Just kidding about the Windows Vista thing, I am actually serious about completing this thesis without irreplaceable data loss along the way. I have already failed my earlier promise to write a weekly post. Last week I was planning to write a post, but all I would have to write about is how I hadn't got started on my thesis yet, and I was too embarrassed to do that. So I did it this week. But, I can also add the happy news that I finally did get started, and even made some real progress. In the meantime, I've also picked up a sweet summer job, found a thesis-writing office (thanks to the lovely Eldene Schmidt), cleaned out two closets and mastered a bun recipe. The Barn Hunter is back in business. So, first of all, what is a thesis? I could probably use a reminder myself, so I'll peruse the Oxford Dictionary of Current English to see what it has to say. thesis /thee-siss/ n. 1. a statement or theory put forward to be supported or proved. 2. a long piece of written work involving personal research, written as part of a university degree. The thing I'm working on now is the second definition, though it must also contain the first definition. A thesis within a thesis. There's a lot of pressure invovled with these things. When I first began gradaute school, I really did not believe I had the ability to pull it off. I'm still a bit doubtful, but now that Ive started, I realise that, as difficult as it is, it's not quite as insurmountable as I had initially imagined. Really, a thesis is just five term papers all mashed together to support one main thesis. That's it. Easy. I've got the information to do it, now I've just got to do it. And that's the hard part. I think most graduate students have lofty visions of writing an amazing thesis that will have all professors in the department falling over themselves with praise, and publishing presses beating down the door. It is seen as a sort of culmination, a cherry on top to the work of graduate school. In a way it is, but in another way it's just another exercise to slog through on the way to earning that heavyweight piece of paper that says Master on it. We all want to feel like we have actually mastered something. I'm realising that it's sort of human to feel that way, and we better give up on actually achieving it if we ever want to have some peace of mind. My friend Teresa has said to me on multiple occasions, "the only good thesis is a done thesis." My former professor and good friend Dr. Allison Fizzard told me just recently that "perfection is the enemy of good." So, I'm learning to let go of my grand visions and simply sit down and start typing away. Which brings me to the point of this whole post: how to write a thesis, barn hunter style. I have three excellent and brilliant friends working on their theses right now as well. They reached their writing stage before me because my trip to England last year meant my research was pushed back. Thus, I had friends who had already gone through the proposal stage before I did, friends who talked me off the cliff. These are Meghann, PhD candidate, and Noah and Claire, my fellow MA cohort pals. Like most graduate students, I have a giant case of imposter's syndrome, and spend a lot of my time wondering why they ever let me into graduate school. I've always believed that I don't do things the proper, scholarly way. Watching my friends work on their theses made me even more convinced of that. They do things properly. They have organised notes, they read all their sources beforehand and have very neat post-it notes marking each place they want to cite, they have diligent working habits. I possess none of these skills, and was starting to really panic about it. Then, my supervisor said something along the lines of: "it's your thesis, you can write it however you want." And then the epiphany struck. When it's done, no one will know how I got to that point, so I can just write it as haphazardly as I've written every other academic paper. 1. Sit and stare into space for at least an hour before doing anything else. 2. Mentally berate yourself for being a failed academic and a mediocre human being. 3. Open your word processor. 4. Fiddle around finding appropriate tunes - usually classical a la Ralph Vaughan Williams and/or Vivaldi mixed in with some flavour of the week rock/pop playlists. 5. Write like a wild thing possessed by the Furies, urged on by the Muses and guided by Hermes. This will last for approximately twenty minutes. 6. Assess the results: several paragraphs of single spaced drivel. 7. Surf around on the internet mindlessly for no less than one hour. 8. Repeat steps 5 and 6. 9. Emerge into the sunshine for a brisk walk. 10. Repeat steps 5 through 10. That's my daily agenda. Also, there is to be no chronological progress. Open whichever chapter you feel like writing about, and just start typing. When bored of that particular topic, switch to another chapter. When writing a thesis, it's important to set goals and deadlines for yourself. Even someone as disogranised as I am needs that bit of structure. When I first began, I had goals of "Chapter ___ complete by _____." But then I realised I wouldn't write like that. I just can't. I have to be disorganised and half crazy for anything good to come out. And so now my goal is simply to write five pages per day/twenty pages per week. I'm aiming for a 150 page thesis, including photos and diagrams, so that means that I should be on course to finish by the end of the summer. Progress for week of May 12-18th: 13 pages. So, yeah, I didn't make it last week. But that's okay! I only actually worked for two full days last week due to some extenuating circumstances, some legitimate and some just me being a procrastinator. I am happy with thirteen pages last week. Next time I post, it should be at least 33 pages. Until then....here's another picture of a barn. This barn west of Radville is the only barn with an existing silo in my region. It was once used as a feedlot in the 1960s. Photo October 31, 2013. It's been awhile. I apologize for the lengthy silence, but I was busy trying to survive winter in St. John's, my last bit of coursework, and having a bit of fun, too. But I am now returned to my native land, the place where all of my barn hunting adventures began. I have successfully passed my final course and come through the daunting thesis proposal presentation. My next task as a barn hunter is to take all of the goodies I collected and turn them into something halfway comprehensible. Then, if I'm lucky, the good folks at Memorial University will deem it good enough to let me walk away with a Master's degree. Barn hunting in the field was rarely a lonely task. I often had a sidekick along with me, whether it was Stacy or my dad or my sister. When I was flying solo, I always had people to talk to when I drove into their yards. Even at the archives I had other people to help me out or chat with. But this part of the process is different. I have to go at it alone. I have a lot of frustration, long days and hard work in front of me. The looming spectre of procrastination is hanging over my head, grinning ghoulishly. But perhaps this blog will help make me accountable. I'll endeavour to update it weekly, as I did last fall. It may not be as in-depth as it was before, but I'll try to at least post a few new photos every week, as well as an update on the thesis progress. If I make the process a little bit public, perhaps I'll be able to shame myself into actually doing it. Right now the birds are chirping and the frogs are singing outside my window. It's still very cold for this time of year (we even had snow yesterday), but spring is coming. When it comes, it will come fast, and it will take all my willpower not to succumb to the urge to gambol through lilac bushes all day long. Some say that writing a thesis can actually be rewarding. 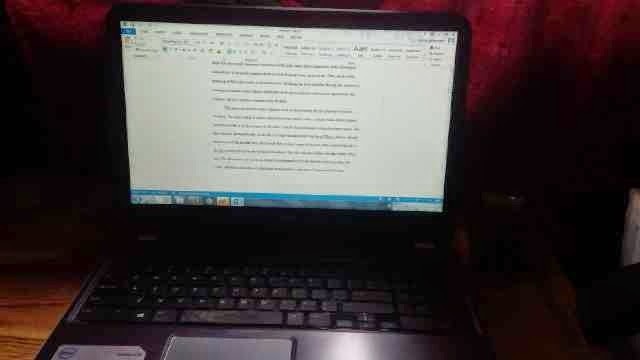 That remains to be seen, but one thing I can promise you is that the thesis will get done, somehow or another. I look forward to dragging you along with me. Until next week, here's a barn photo to tide us all over. October 29, 2013. Northwest of Ceylon. Members of the Verot family in front of their barn on the occasion of the Verot century family farm celebration in 2004. Photo courtesy of Alexina Verot. My favourite thing in the world is to chat with older people, particularly seniors. Ever since I was a kid, I wanted to eavesdrop on conversations and hear stories about the old days. It's a good thing I'm pursuing a career as a folklorist, then, since I get the chance to do that all the time. People's memories are precious. I recently attended a presentation by my friend and folklorist Lisa Wilson about oral history. Lisa mentioned that it is important to interview seniors not only because of their own rich store of memories, but because they also have access to an oral tradition that stretches even further back in time, stories and memories passed down from their parents and grandparents, and so on. This has changed and continues to change as our methods of communication become more technological in nature. Here is a link to Lisa's excellent blog Folk Traditions. As you browse through the pages, you will come across many examples of oral history. Lisa's work is an inspiration to me, and I am happy that I was able to conduct several interviews during the course of my barn research. Each and every interview was special in its own way, and I left each one feeling like I had either strengthened an existing friendship or built a new one. I hope to eventually share snippets from each one of my interviews, but to begin with I will start with an excerpt of the very first interview I conducted this past fall with the Verot family about their 96 year old barn. Sharon Verot had contacted me to let me know that her mother-in-law Alexina was very knowledgeable about their barn and that she would be great to talk to. And so on a late October day, a snowy one as I recall, I went to the Verot farm to interview Alexina, her son Dave and his wife Sharon. I knew Dave and Sharon quite well already since I attended high school with their daughter, Brett, but I had never met Alexina before. Alexina Fradette was born in 1927 on a farm south of Radville in the Freda Lake district. She grew up speaking French and didn't learn English until she started walking to school with an English speaking neighbour. In 1945 Alexina married Peter Verot and moved to his farm southeast of Radville, in the Souris Valley area. They spent the next 35 years there farming and raising their family, experiencing many hardships along the way, including a destructive tornado or plow wind which partially destroyed the barn in the second year of their marriage. This was a devastating event since the barn was so integral to their livelihood. I will let Alexina speak for herself now, to describe that event. All of the black and white photos in the video came from Alexina. She and her family took many photos over the years of their everyday life on the farm which are now kept safely in Alexina's photo albums. These photos are truly a treasure, and I am so grateful to Alexina for trusting me to borrow and scan them. If you have trouble with the embedded video, here is the Youtube link. After the interview we all went out into the barn, and there Alexina lit up. Before anyone knew what she was up to, she had darted up the ladder into the hayloft. Despite my fear of heights, I couldn't be outdone by a lady in her 80s, so I slowly clambered my way up after her. Alexina also pointed out many artifacts from the barn. It was a building she knew inside and out and those memories have never left her. It was an honour to hear some of them. Alexina deftly climbs into the hayloft while Sharon watches. Alexina poses with a cream can. The "cream check" was once a hugely important part of many farm families incomes. Alexina examines some tack still hanging in its place in the barn. Alexina on horseback in 1947, the same year the barn was partially destroyed by a tornado or plow wind.